I recently brought the kids for one of our annual blueberry picking trips. In total, we picked 12.5 pounds. I froze many of them but kept a big bowl’s worth aside to make some fresh baked goodies. Blueberries are one of my favorites and you really can’t beat fresh picked. 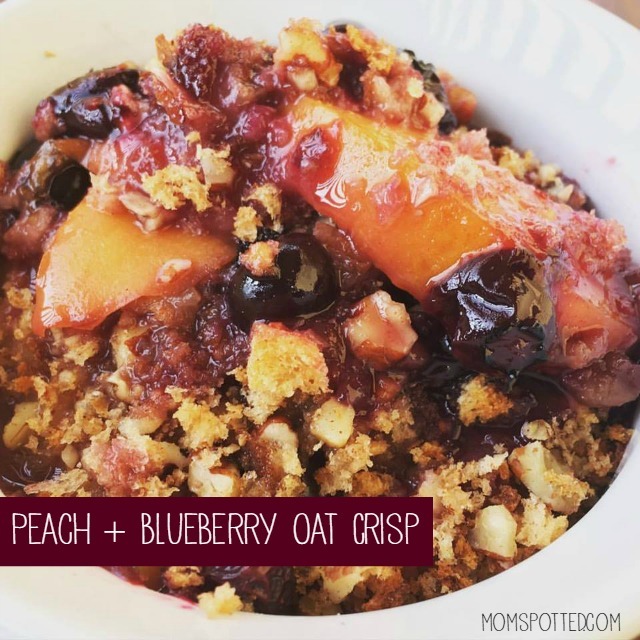 I recently stumbled upon this Peach and Blueberry Oat Crisp Recipe recipe when Arnold® bread asked me to partner up. I knew immediately I had to try it. *Diets low in saturated fat and cholesterol, and as low as possible in trans fat, may help reduce the risk of heart disease. 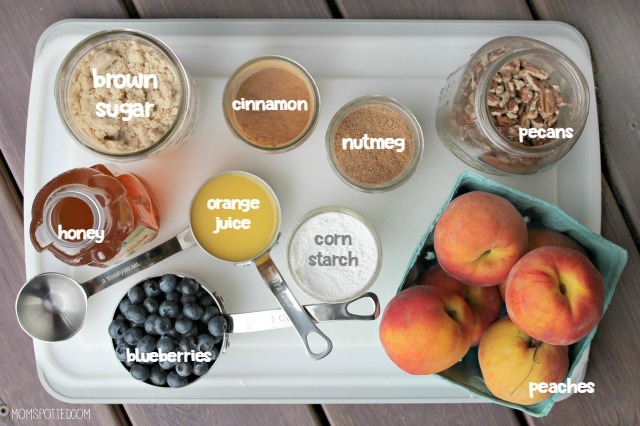 In an 8×8 baking pan, add your blueberries peaches, orange juice light brown sugar, honey, nutmeg, and cornstarch. Mix together. Then in a food processor, add the Arnold Whole Grains Oatnut bread and cinnamon and pulse until it becomes soft bread crumbs. Add in pecans and pulse a few more times until it’s all the same consistency. Then sprinkle over fruit mixture. 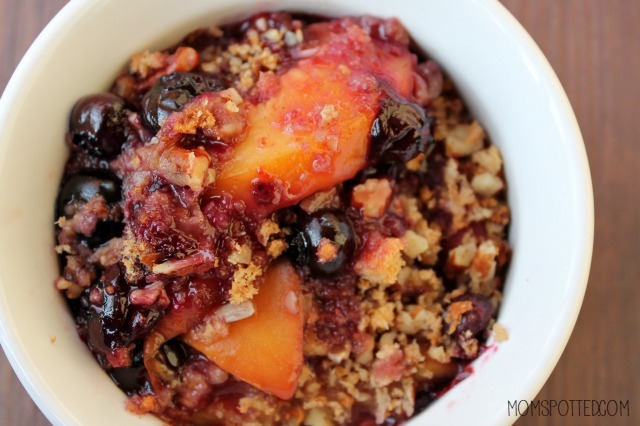 Bake for 30 minutes until the bread crumbs turn golden brown and the fruit mixture is bubbly. I wish I could share the smell with you. 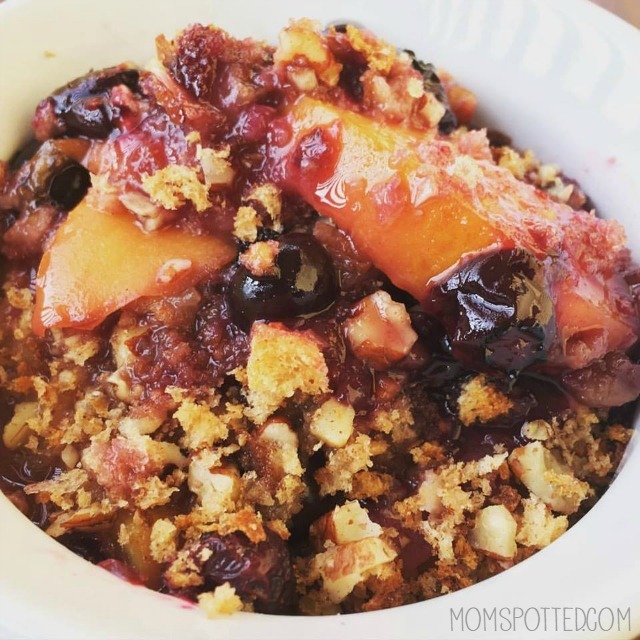 Everyone in the house just ended up flocking to the kitchen to see what smelled so good! The only thing I was missing was vanilla ice cream. I definitely recommend pairing the two. 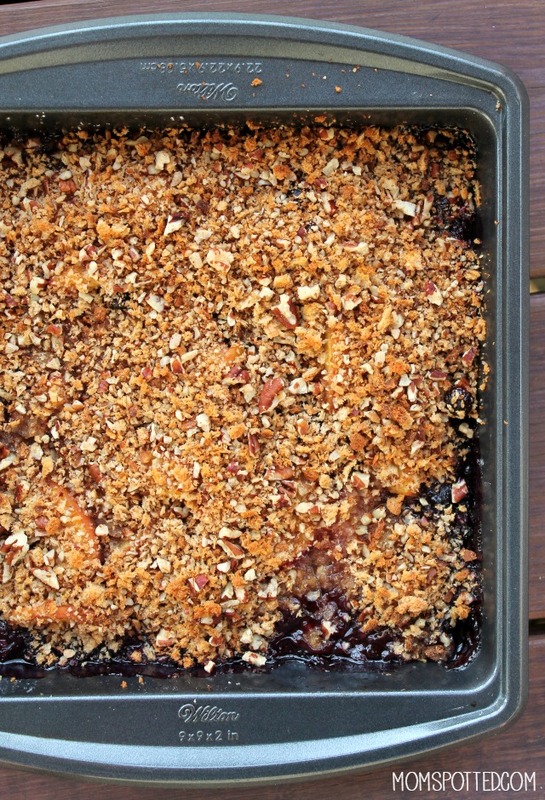 Of course, before you eat dessert you’ll need a good dinner. With all our crazy schedules around here, sandwich night is a favorite! 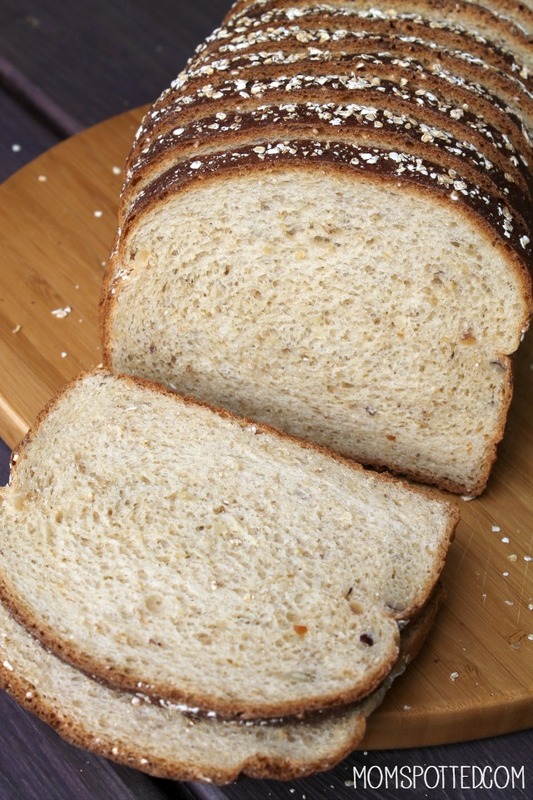 Right now, Arnold® Bread wants to hear what healthful ingredients their fans use to make the perfect sandwich with their delicious, made with whole grain bread, so Arnold® Bread is hosting the“2016 America’s Better Sandwich” Contest! The sandwich architect whose filling matches the goodness of Arnold® Bread will win a grand prize of $25,000. Entries will be accepted June 15th – August 21st, online consumer voting will take place September 26th – October 23rd, and the winners will be announced on National Sandwich Day- November 3rd. More information on the “2016 America’s Better Sandwich” Contest Official Rules and Donation Program terms and conditions can be found at http://www.americasbettersandwich.com. 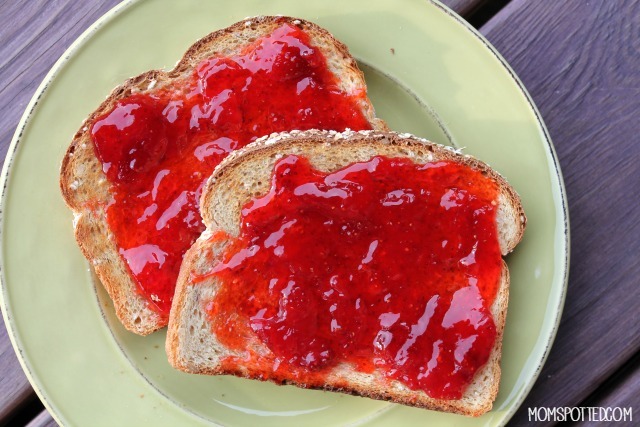 Personally, when I see delicious, whole grain bread like this I can’t wait to slather a bunch of my homemade strawberry jam on top and eat it as fast as possible. 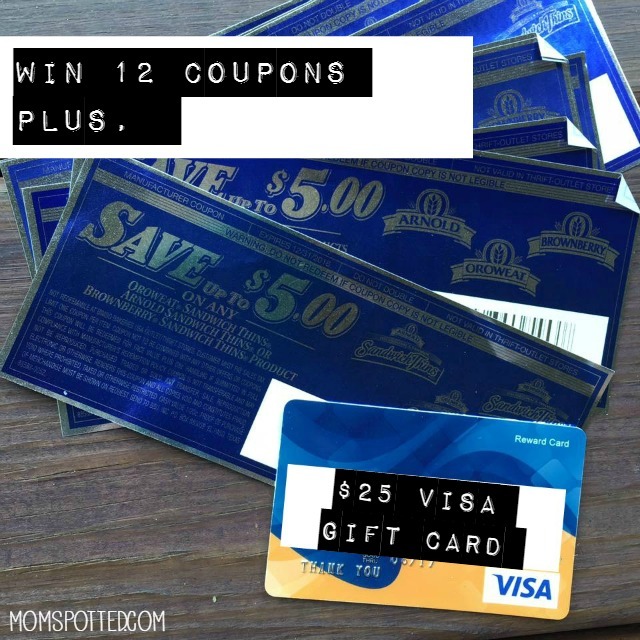 Right now one (1) Mom Spotted reader has the opportunity to win $25 Visa Gift Card along with six coupons, each valid for $5.00 off the purchase of any Arnold® Whole Grain Sliced Bread of choice and six coupons, each valid for $4.00 off the purchase of any Arnold® Sandwich Thins® Rolls of choice. I would use the safe for my phone, keys, and money; my favorite sandwich is ham and cheese and lettuce; their Buttermilk bread is great; and your recipe is so creative 🙂 Thanks for the chance. I think you might have the wrong mandatory question? But I would use my SafeSpace® Portable Personal Safe for things like my cash money, credit cards, and my iPhone. My favorite sandwich includes ham, lettuce, tomatoes, black olives, and mustard! I would use my SafeSpace Portable Personal Safe to store important documents and bills. I would use the Safe for cash money, credit cards, and my phone. My favorite sandwich is a Roast Beef with cheddar cheese, tomatoes, lettuce, mayo on Whole Wheat bread! I would put red onion, provolone cheese, pepperoni and bell pepper. My ultimate sandwich is BLT with lots of mayo and fresh pepper. I would put cajun turkey, baby swiss, avocado and sliced tomato with chipotle sauce on wheat for my ultimate sandwich. My sandwich would be tuna and Swiss cheese. I would put turkey, cheese and bacon on my sandwich. I would put, turkey apple & gouda grilled cheese . I would put lettuce, mayo, tomato, bacon and avocado. I Like A BLT With Cheese, Lettuce, Tomato And Mayo. My favorite sandwich would be bacon, lettuce tomato and extra mayo (although I do love a good peanut butter and strawberry jelly sandwich). My ultimate sandwich is chicken salad with bacon, lettuce and tomato. I always load my sandwiches with veggies, lots of veggies, especially fresh from the garden during the summer! I actually had a veggie sub for lunch yesterday – spinach, tomatoes, onions, pickles (canned last fall), sprouts, peppers! Yum! My sandwich would have thin sliced turkey, mayo, butter lettuce, tomato and avocado. A nice smokey ham and a ton of pickles! I would use sliced tomatoes and avocados on my ultimate sandwich. turkey, ham, bacon, lettuce, pickles and mayo! i would put ham, cheese, pickles, and mustard. My ultimate sandwich would be provolone, turkey, and avocado on oat and honey wheat bread! Mine would have cheese and bacon for sure! I would love to have some avocado in there too! I would build my ultimate sandwich with whole grain bread, corned beef, cole slaw, and thousand island dressing. I would put bacon, lettuce, and home grown tomatoes in my ultimate sandwich. I would put maybe smoked chicken with any & every veggie I could think of & pepper jack cheese!! I would make a chicken salad with walnuts and cranberries. I love to add cooked ham, lettuce, tomato , and a pinch of pepper. I’d put turkey, swiss, lettuce, tomato and mayo on my ultimate sandwich. I like lettuce, mayo, mustard,and ham. I love turkey, mayo, tomato, avocado and bacon on my sandwiches. I like make egg sandwiches, so good! I would use beef, tomatoes, and sriracha sauce! I would put slow cooked pastrami and sauerkraut with my secret sauce. I enjoy a thick BLT with melted cheese and jalapenos. And I want a whole grain bread. I’m a simple gal so I like my sandwiches with ham, cheese and mayo. Thank you! I’d use chicken or turkey breast, roast beef with provolone and Muenster cheeses topped with tomatoes, spinach, cucumbers and avocado! I’d put bacon, roast beef, roast turkey, romain lettuce, sharp cheddar, and tomato slices on my ultimate sandwich. I use avocado and Dijon mustard on my turkey and tomato sandwich! I would make a spicy egg salad sandwich. Egg salad is my favorite sandwich. And I like to add a little crumbled bacon. Gotta have bacon, turkey, tomato and lots of mayo. Ham and bacon and American cheese and Swiss cheese and lettuce and tomato and lots of spicy mustard on multigrain bread. whole wheat bread, turkey, mayo, lettuce, and mustard! I’m a fan of the classic PB and J. On the sweet side my favorite sandwich is with honey peanut butter & jam and for a savory favorite is with turkey/chicken, lettuce, bbq sauce and a couple of potato chips. My ultimate sandwich is turkey, swiss, sriracha mayo and some thin avocado on a good oat nut or ciabatta! I love adding avocado slices to my sandwiches! Rueben’s have always been my thing! Corned beef, Swiss cheese, and sauerkraut is my perfect sandwich! I would put egg salad, tomato and lettuce. I would put egg salad, bacon, lettuce and tomato. My ultimate sandwich is actually quite simple: Good bread spread with butter, filled with sliced leftover roast chicken, lightly salted. Maybe a piece of crunchy lettuce, too. My ultimate sandwich is honey ham, Swiss cheese and mayo grilled to perfection! I love bologna and mayo the most. I would make it with ham, cheese, lettuce and mayo. I would use provolone, bacon, avocado, and turkey! I would love roast beef with swiss cheese, red onion, lettuce and tomato! I love Italian sandwiches, so I’d use pepperoni, salami, and provolone cheese. I’d also add lettuce and Italian dressing. I’m a pretty simple girl… cheese, ham, and some kind of sauce! My favorite sandwich is roast beef, cheddar cheese, lettuce, cucumbers, pickles and mayo. My ultimate sandwich would include Black Forest ham, bacon, colby jack cheese, and mayonnaise. Thanks. My ultimate sandwich would have sliced chicken, tomato, lettuce and honey mustard on whole wheat bread. I like a chicken salad sandwich on white bread. My favorite sandwich has pickles, deli mustard, mayo, tomatoes, ham and lettuce. turkey, bacon, lettuce,, tomato and mayo! I would use lots of cheddar cheese and bacon to make the ultimate grilled cheese sandwich! I’d put chicken salad, celery and dried cranberries on toasted honey wheat. turkey, cheese, lettuce, mayo, pickles, bacon and avocado. I like turkey, mayo, tomato, lettuce, avocado and pickle on my sandwiches. Thin sliced roasted turkey, cranberry sauce, and swiss cheese would be good on the bread. My favorite sandwich is grilled cheese with homegrown tomatoes. I love their bread! I buy their sourdough and country white weekly for our lunches. I would put turkey, mustard, lettuce, tomato, red onion and put it on a flat bread. Buffalo chicken, lettuce, and pickles. I’m very basic. I’d put in Tofurky, avocado, ketchup, Just Mayo, and onions. I would put lettuce, tomato, cooked ham , and a pinch of pepper. My ultimate sandwich would have turkey, arugula, caramelized onions, banana peppers, smoked cheddar and jalapeno raspberry preserves. I use turkey, applewood bacon, avacado, tomato, black olives and mayo on whole grain bread! My perfect sandwich is chicken salad with big chicken chunks, onion, celery and mayo. I would love roast beef, swiss cheese, spinach leaves, tomato and mayo. It would be tuna. onion, celery and mayo. My favorite sandwich is chicken salad with grapes, apples, and nuts! Mine would have tuna salad, onions, and provolone cheese (yes, provolone. lol)! Turkey, bacon, avocado! I’m easy to please. I’d love turkey, swiss, bacon, mayo, cucumber, tomato, and lettuce! i would put bologna, lettuce, tomato, pickles, oil and vinegar. I love BLT’s, so bacon, lettuce and tomatoes!! My ultimate would be roast beef, lettuce and tomatoe.